The Chinese mountain cat is fairly large - about twice the size of a domestic cat - with a stocky build and a relatively short tail. Its head and body length is about 76 cm (30"). One male weighed 9.0 kg (20 lb), a female 6.5 kg (14 lb). The Chinese mountain cat's fur is a nearly uniform, pale yellow-gray. It has distinctive ear tufts. The last part of the tail is encircled by 3 - 4 dark rings, and the tip of the tail is black. The principal habitat of the Chinese mountain cat is comprised of mountainous terrain; including alpine meadow, alpine shrubland, coniferous forest edges, and hilly loess steppe grassland, at altitudes between 2500 - 5000 m (8200 - 16,400'). It may also occur in desert habitats, but this is yet to be confirmed. The diet of the Chinese mountain cat is thought to consist mostly of small mammals such as pikas, hares, and white-tailed pine voles. Pheasants and other birds are also taken. The Chinese mountain cat is primarily nocturnal. It hunts early in the morning and during the evening and rests in caves or holes (e.g. beneath trees) during the day. Male and female Chinese mountain cats live separately. The Chinese mountain cat is endemic to China and has a limited distribution. Records of its occurrence are known from the eastern border of the Tibetan Plateau, mostly from Qinghai Province, but also from other areas farther north, east and northwest. At present it is confined to the provinces of eastern Qinghai and northern Sichuan, and possibly to the mountains of southern Gansu. The most important cause of this cat's decline is the loss of its prey base. Large-scale poisoning campaigns have been conducted since 1958 in China in an attempt to reduce populations of pikas and zokors, which are viewed as grazing competitors of domestic livestock. 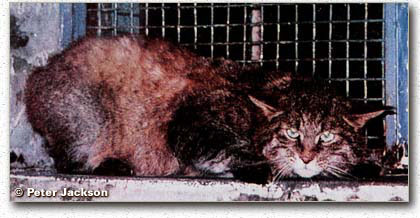 Control programs using poisonous chemicals continue throughout much of the Chinese mountain cat’s range, and they have eradicated the cat's prey from large areas. No other major threats are currently known, although its fur can be found in some markets - it is valued for the making of traditional hats. *** On closer examination, it can be seen that the individual hairs making up the Chinese mountain cat's fur are gray closest to the skin, turning abruptly to brown, and ending with blond tips (Chen et al. 2005) . 2005: Occurs in China (IUCN 2005). Based on estimates of geographic range and average densities of other small cats, the Chinese mountain cat’s total effective population size is estimated at below 10,000 mature breeding individuals, with a declining trend (IUCN 2005) . The Chinese mountain cat is found in the Mountains of Southwest China Biodiversity Hotspot (Cons. Intl. 2005). Mating occurs in January - March and most young are born in May (Sunquist & Sunquist 2002) . Litter size is probably 2 - 4 (Sunquist & Sunquist 2002) . Age at independence is 7 - 8 months (Nowell & Jackson 1996) . The diet of the Chinese mountain cat is thought to consist mostly of small mammals such as pikas, zokors, hares, mole-rats, and white-tailed pine voles. Pheasants and other birds are also taken. (Li He et al. 2004, IUCN 2005) These cats have been observed hunting mole-rats by listening for their movements in their underground tunnels (3 - 5 cm (1 - 2") below the surface), and digging them out (Nowell & Jackson 1996) . The Chinese mountain cat rests in caves or holes (e.g. beneath trees) during the day (Chen et al. 2005) . Birth dens are in burrows, usually situated on south-facing slopes (Sunquist & Sunquist 2002) . Male and female Chinese mountain cats live separately (Nowell & Jackson 1996) .